The National Museum of Ireland at Collins Barracks is home to a major award-winning exhibition on the Irish military experience. Entitled Soldiers and Chiefs: The Irish at War at Home and Abroad from 1550, it consists of a number of galleries which explore the topic from an Irish perspective both thematically and chronologically. 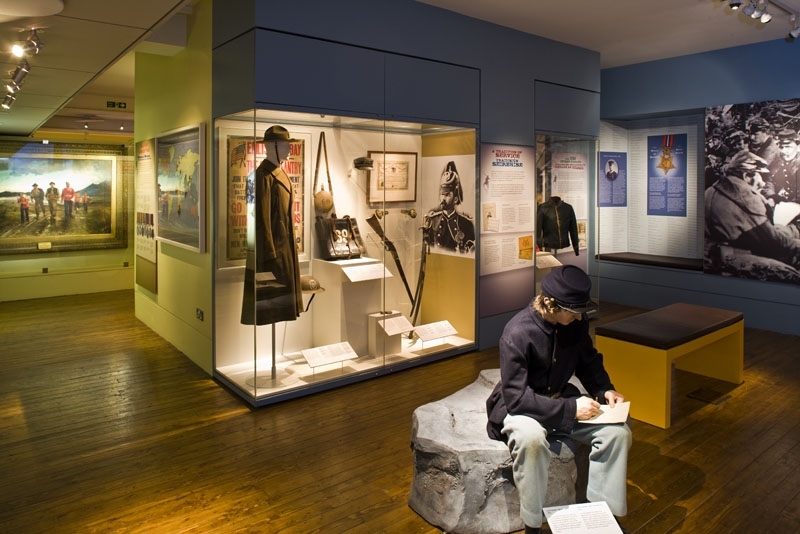 Amongst the displays is a gallery dedicated to the Irish in North America, which includes objects relating to the American Civil War. This section of the exhibition is broken into a number of separate themes, each using objects to tell a particular facet of the Irish story. Given that the majority of the Irish who emigrated to the United States were destined never to return, unsurprisingly there are very few items in Ireland that could be used to illustrate their experience. The National Museum of Ireland turned to institutions and individuals in the United States and Canada such as the 69th Regiment, Kenneth Powers and Patrick McHugh in search of appropriate material, an appeal that was met with great generosity. The story of the Irish in the Union army begins with a replica figure of a soldier in Corcoran’s Irish Legion, engaged in writing a letter. This is inspired by a series of letters relating to Lt. Dan Sweeny of the 182nd New York who was killed by a shell at Ream’s Station on 25th August 1864. The correspondence was written by the young officer’s comrades to his family, in which they describe the circumstances surrounding his death. They related how they succeeded in retrieving Dan’s watch for his family, but were unable to get his sword due to the severity of his wound and the proximity of the enemy. Among the more interesting ‘everyday’ objects on display are two pocket drinking cups, marked ’69th Infantry’ and ‘9th Massachusetts Volunteers’, along with an inkwell and waterbottle of the 69th. The story of the veteran’s experience after the war is told through items such as a cap of the 69th Veterans Corps from c.1870. One of the more unusual displays in the exhibition is a guidon on loan from the Waterford Museum of Treasures. Thomas Francis Meagher’s widow Elizabeth Townsend Meagher visited Waterford after her husband’s death, and brought with her a number of objects commemorating her husband’s time in the United States. Amongst these were two flags, one of which was conserved for display in Soldiers and Chiefs. It has recently been identified as a possible guide flag (1), and bears the inscription ‘5th Regt. Irish Brigade’, the 116th Pennsylvania Infantry. The Irish contribution to the Confederate forces is also recognised, and the Tennessee State Museum and Museum of the Confederacy were able to provide some short term loan objects relating to Patrick Cleburne (including his kepi), the 10th Tennessee Infantry (the standard of its first Colonel Randal McGavock) and a jacket made by Peter Tait’s factory in Limerick, which was run through the blockade to supply the southern forces. Many of the Irish veterans North and South were Fenians and following the war resolved to take part in the ill-fated invasions of Canada. This story is told through one of the green uniforms worn by the Fenians during the invasion, on loan from Parks Canada. Others, such as Myles Walter Keogh, went on to fight in the Indian Wars. He died at the Little Bighorn with George Armstrong Custer, and objects on loan from the Autry National Center include the Carlow native’s 7th cavalry epaulettes. 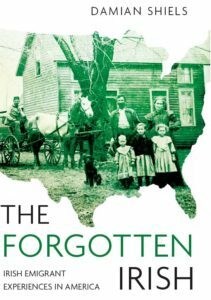 The display is not entirely focused on the Civil War and its immediate aftermath, with other sections exploring Irish involvement in US armed forces in the 20th century. The gallery and the exhibition are well worth a visit for anyone who finds themselves in Dublin and are interested in Irish military heritage. The National Museum of Ireland and the Soldiers and Chiefs exhibition are open weekly from Tuesday to Sunday, and entrance is free. The “cavalry guidon” of the 5th Regiment of the Irish Brigade is in fact an infantry unit guide flag. There would have been two, one each to mark the flanks of the infantry regiment when in line and help the soldiers stay in line when the unit maneuvered. I carried a similar one while acting as Second Sergeant for my reenacting unit. Many thanks for this clarification- I have updated the text and referenced you with regard to it. I had though this was a guide marker some time ago but was unsure- I sent it on to a number of people who were also unsure so it is great to have it positively identified! As far as I am aware this particular flag is probably not known in the U.S., as it came to Ireland such a long time ago and when I first saw it it was in long term storage. It is a really interesting object! Are there any images of this exhibit for those of us who are stuck in the States for the time being? I don’t have any other ones at present, but the next time I am up at the exhibition I will take a few that I can put up on the site to give a better feel for it. The website link will take you to the New York State collection of preserved flags – specifically one of the flank markers (as they are identified there) of the 69th New York (the Fighting Irish) of the Irish Brigade. As you can see, they came in a number of patterns and were marked in different ways as well. If you look through the rest of the online images from the collection you may find others that match the one in Ireland. you will find the text of an advertisement from Leslie’s Illustrated placed by the Tiffany Company of New York listing the flags that the company had delivered to army units, including 2 guidons for the 69th New York.